Home > News > Thank you Arizona! 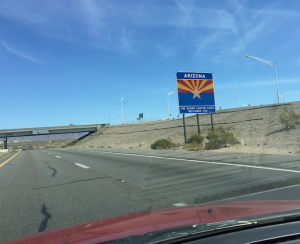 It seems like yesterday – and also like ages ago – that I did a short tour in California and Arizona. It was a whirlwind of music, fun, and new friends. Over nine days in March, I covered 2700 miles, played two full-set shows, three songwriter nights, two open mics, one farmers market, and one happy hour gig. And I met and/or heard more than 60 other performers who I was lucky enough to share some music with. Huge thanks to the fine folks in Morro Bay, Bakersfield, Arcadia, North Hollywood, Los Angeles, Tucson, and Phoenix for making me feel so welcome! Immediately after getting home, I shared the stage with my friends Amber Ikeman, who was on tour from Montana, and John Roy Zat. We had a great time playing at Octopus Literary Salon in Oakland. Then later in the month, I had a show in gorgeous Carmel-by-the-Sea at the aptly named Barmel. This was my first show down there, though not my first time in that lovely town. I had a great time playing at this local watering hole and I’m really looking forward to getting back there again.